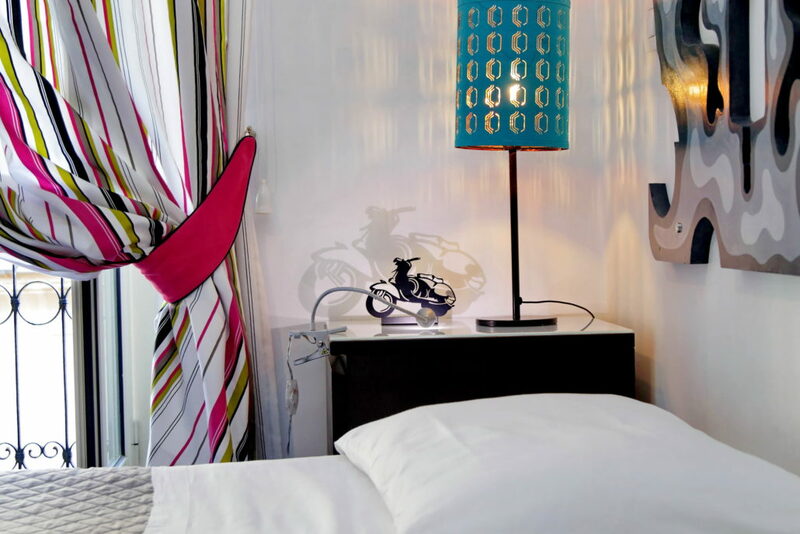 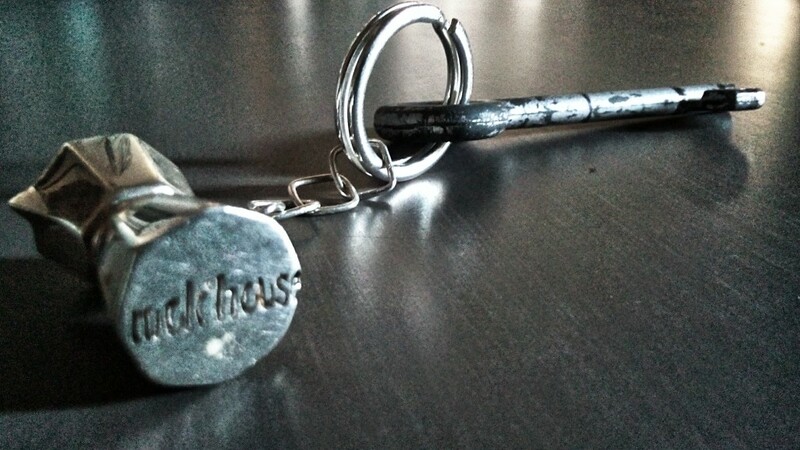 Our Bed & Breakfast is unique in its style, designed with particular attention to details. 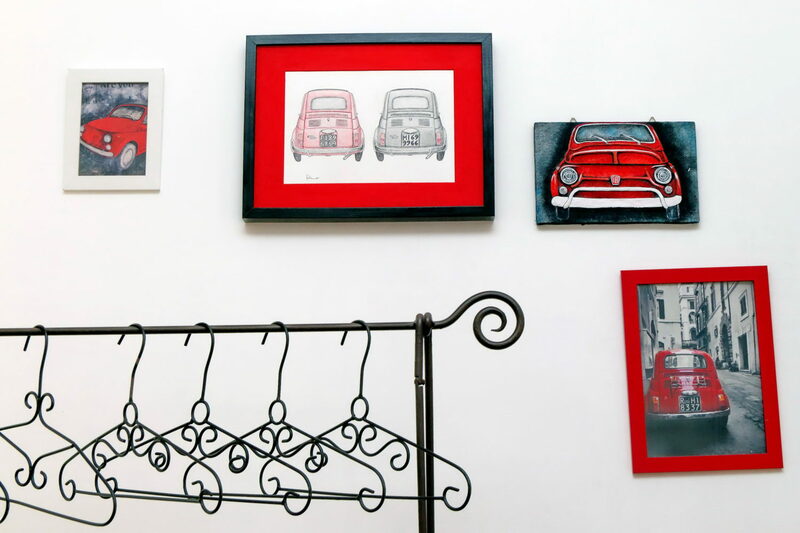 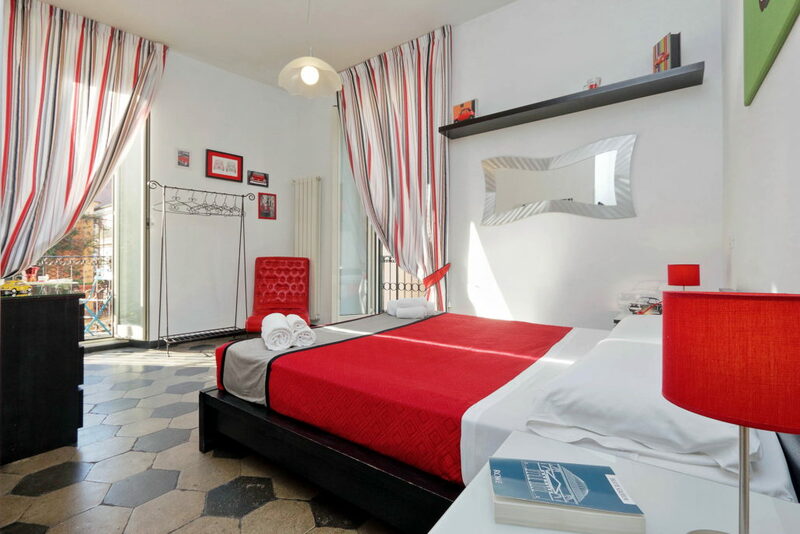 Our two rooms are spacious, welcoming and inspired by the Italian design. 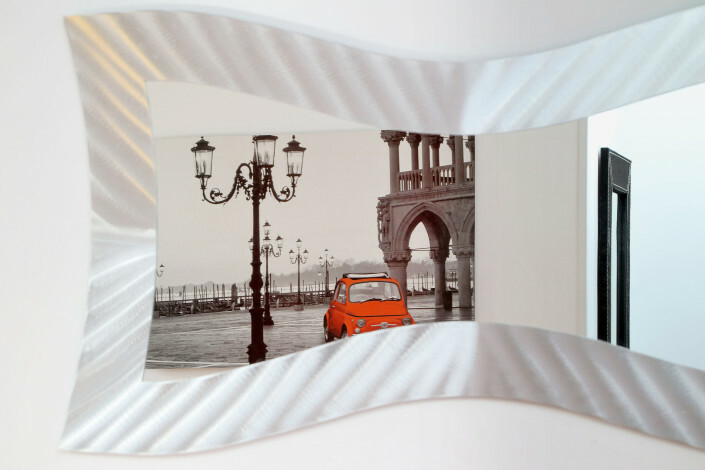 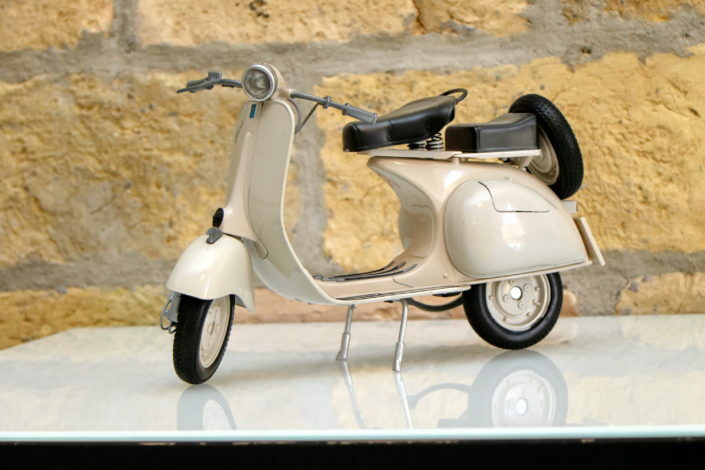 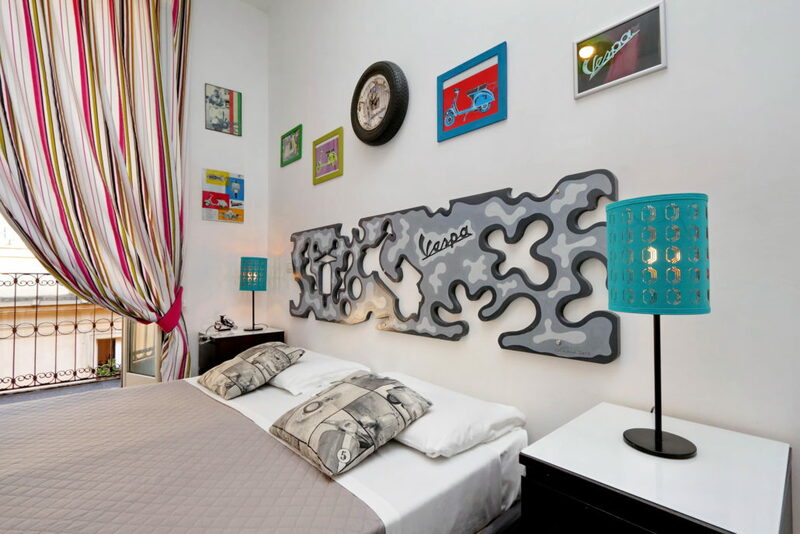 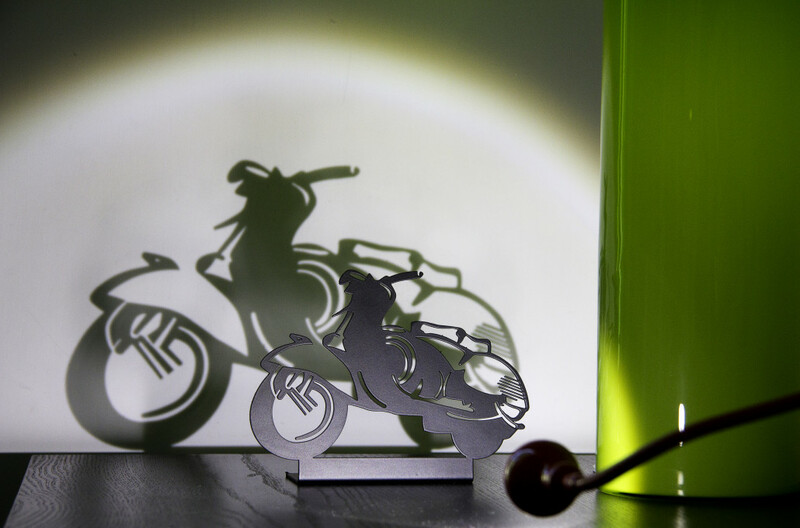 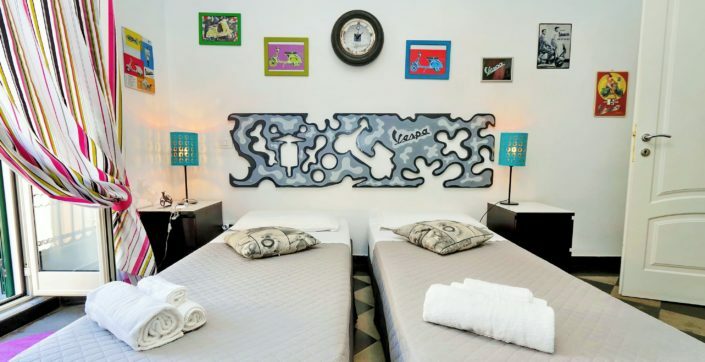 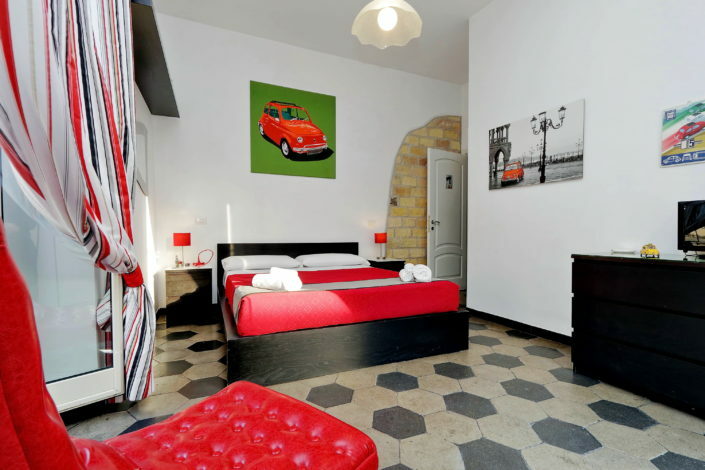 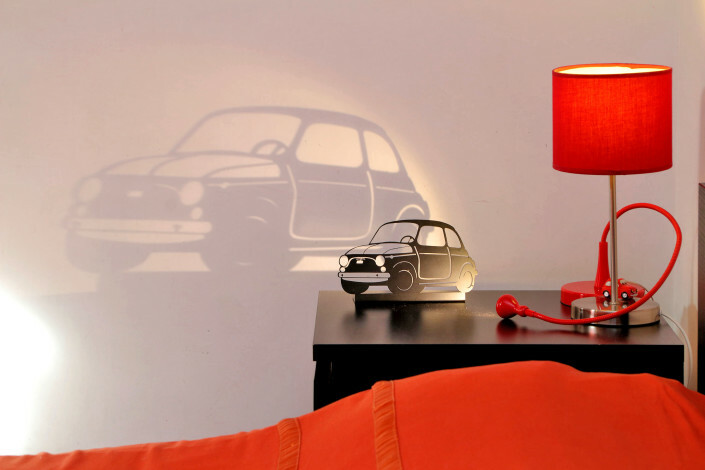 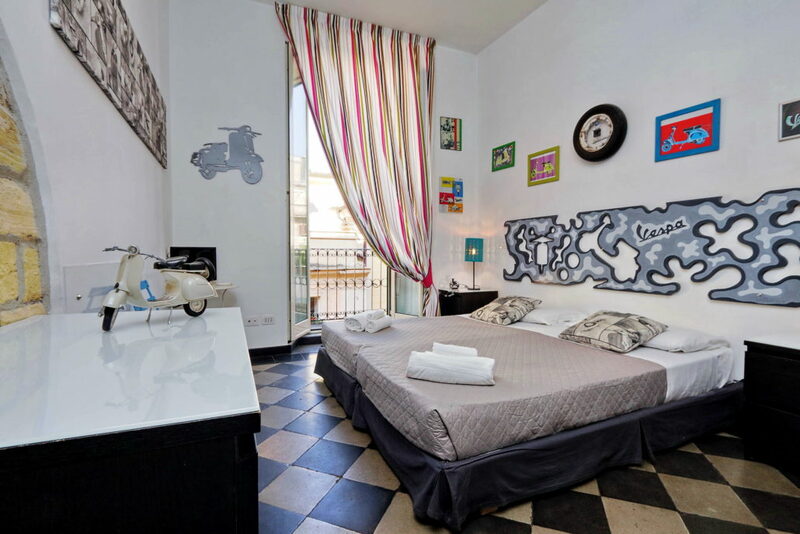 The Room 500 and the VESPA Room are rooms dedicated to the travelers that are willing to experience the the sincere Italian hospitality. 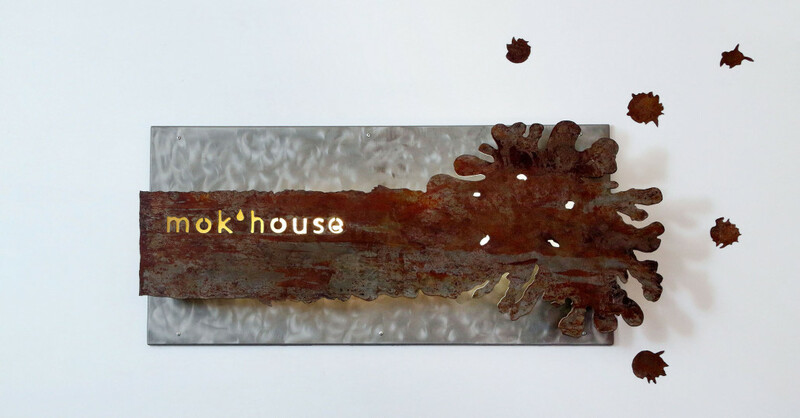 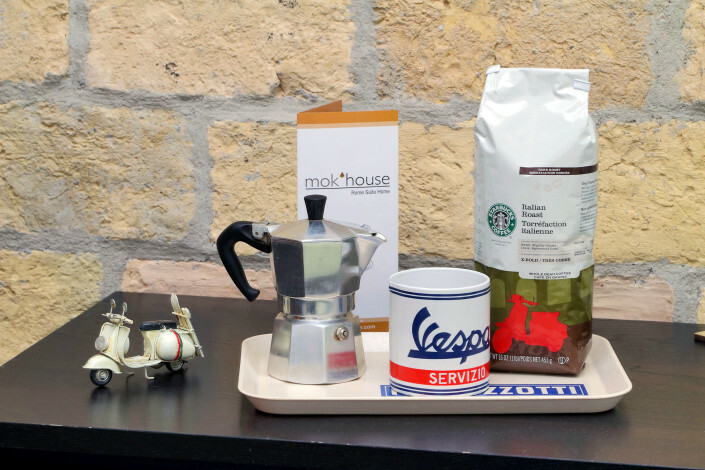 mok’house Bed & Breakfast is not an ordinary hospitality solution and beside being an original accommodation, it is also offering top comfort and total privacy. 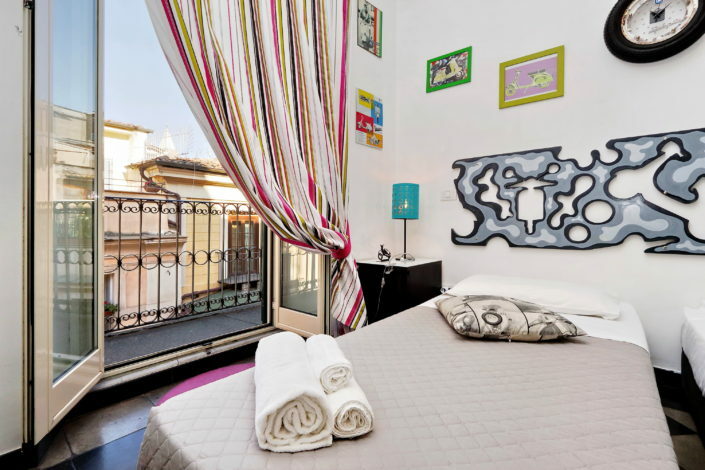 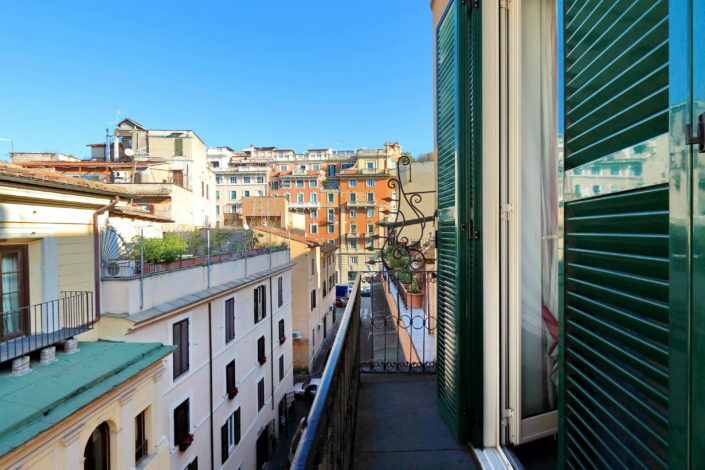 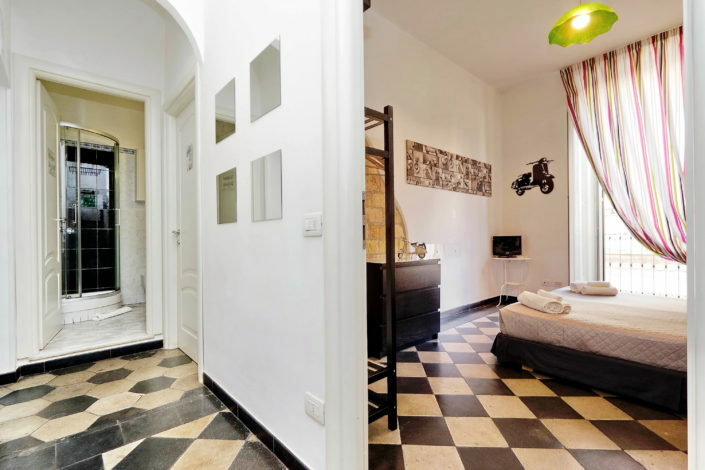 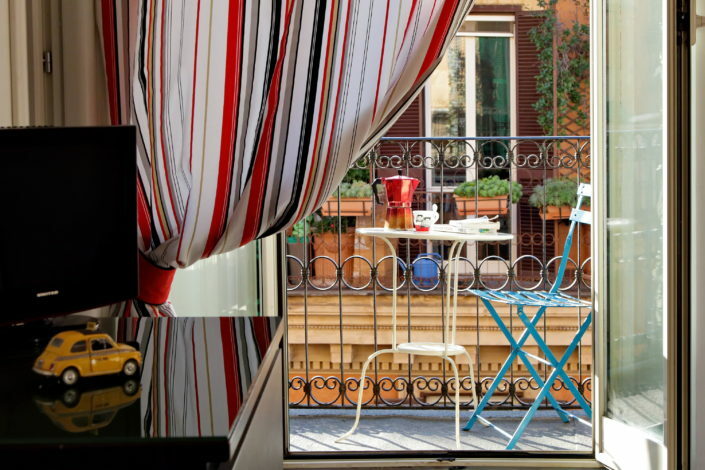 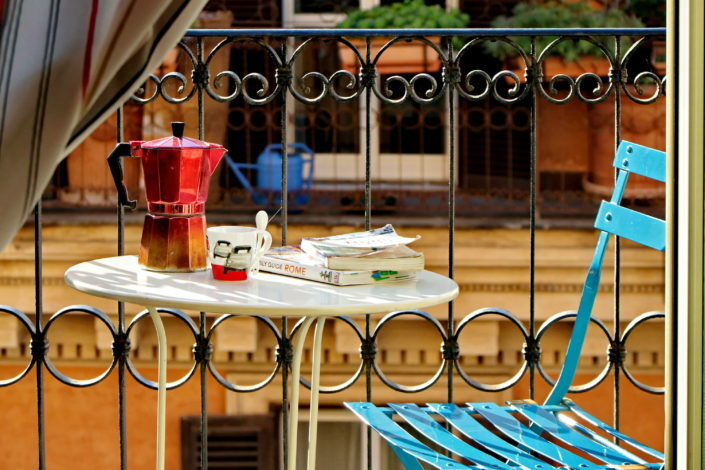 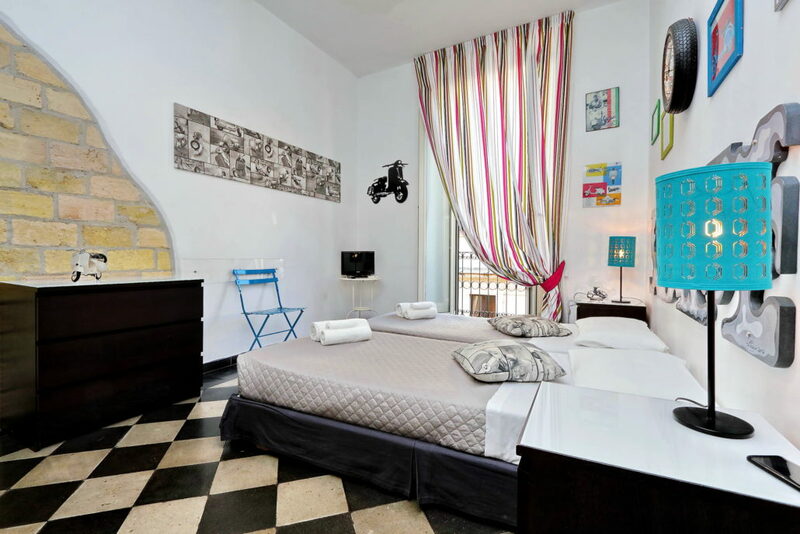 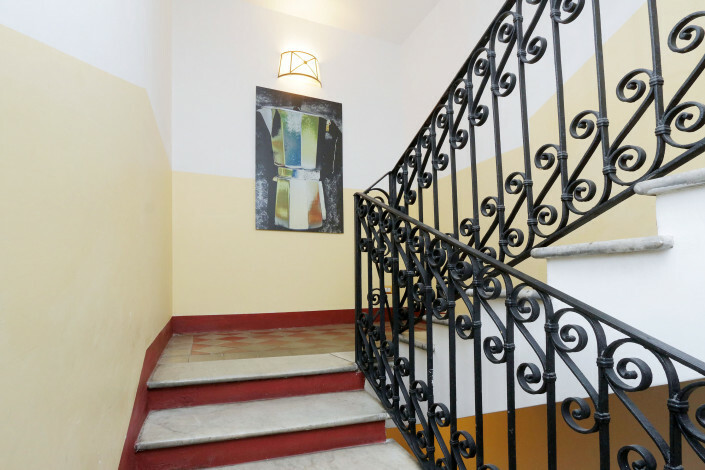 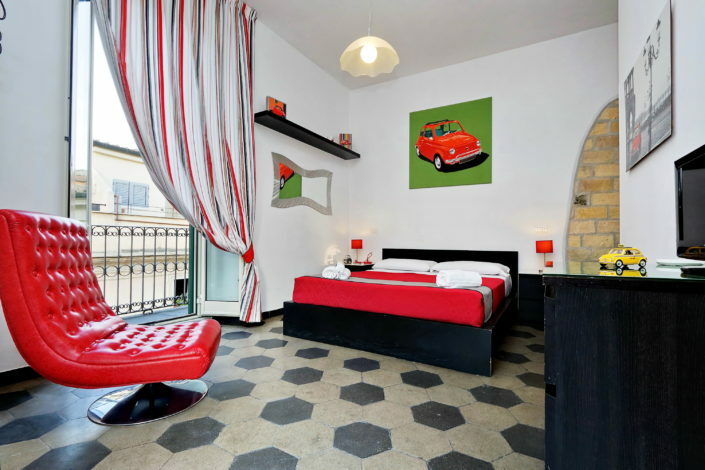 Both rooms have a lovely balcony that will give a picturesque view over the roofs of Rome while the independent access guarantees absolute privacy to our guests. 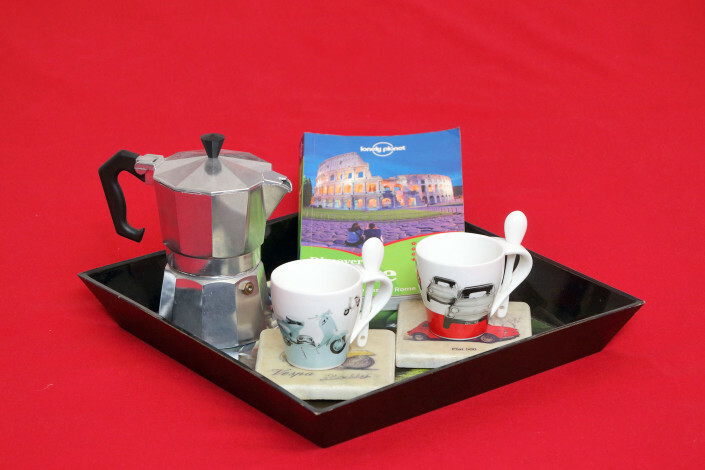 For our guests’ free use 24/7 we have also installed a fridge, a coffee machine and a kettle with selection of tea and coffee. 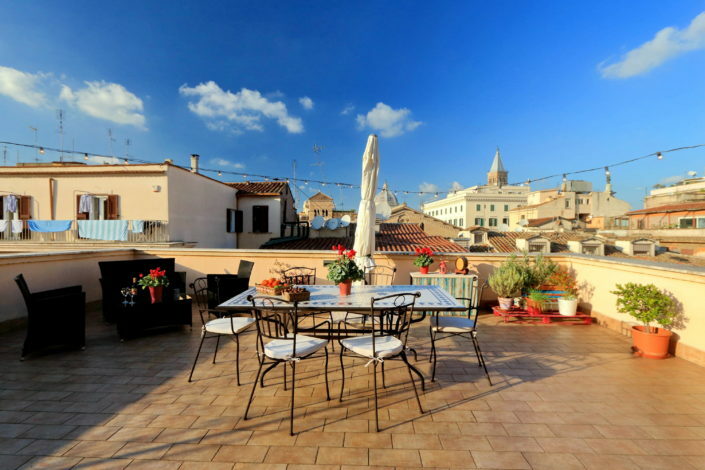 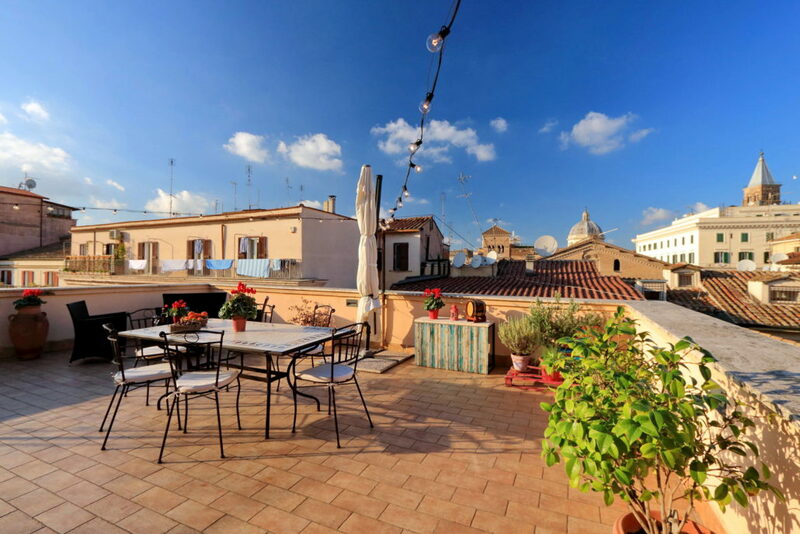 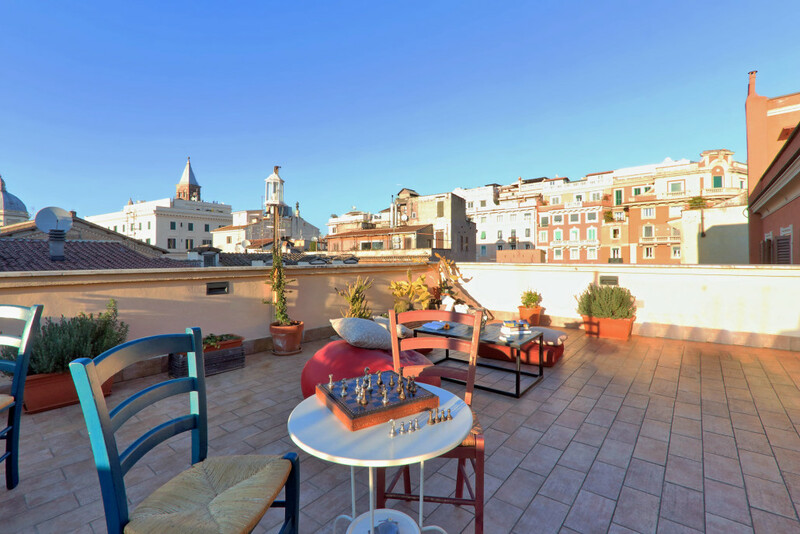 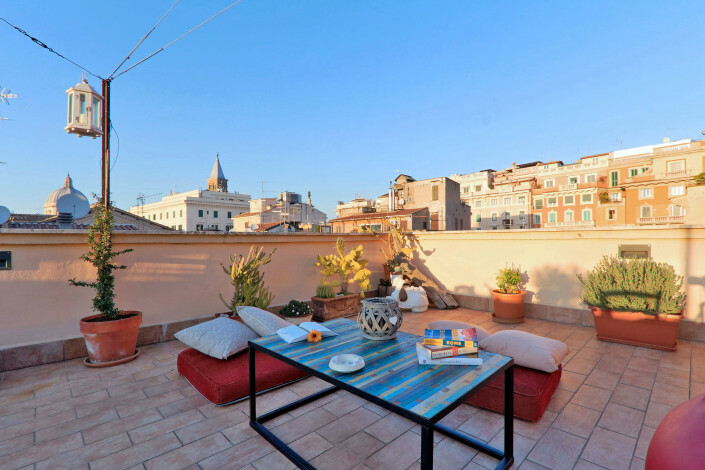 All guests of mok’house Bed & Breakfast, as well as those of mok’house Vacation Rentals, have free access to our stunning rooftop terrace where they will have the chance to relax while admiring a breathtaking sunset over the roofs of the Eternal City. 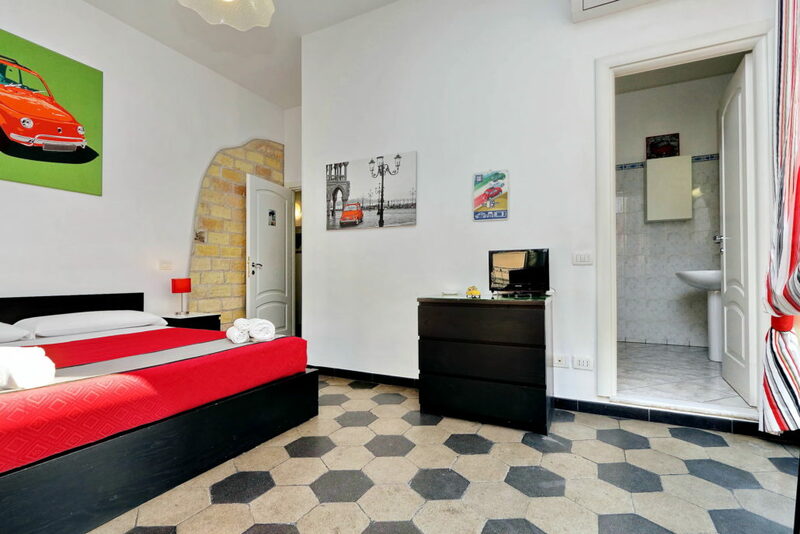 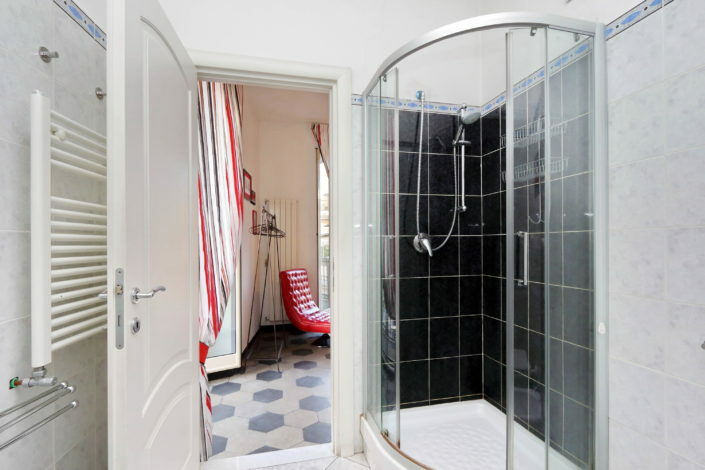 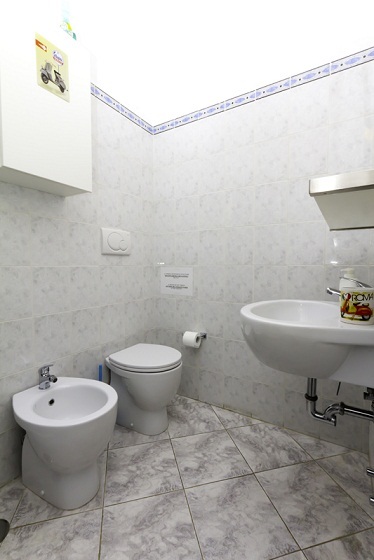 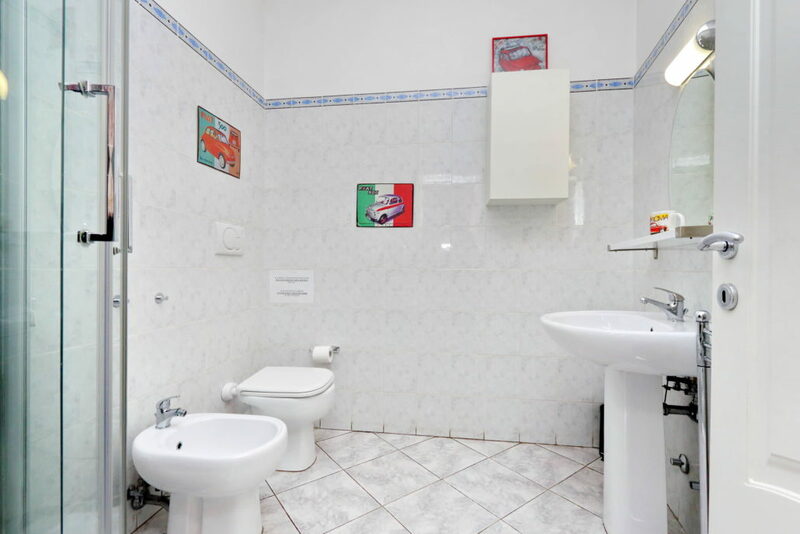 Bathroom: The small difference in the daily rate of the two rooms is justified by the fact that the Room 500 is bigger, en suite and has a larger portion of the balcony. 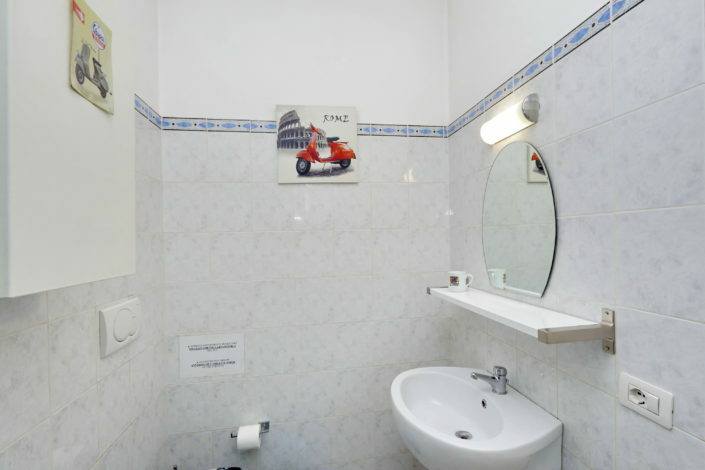 The Vespa Room bathroom is still exclusive but not en suite: it is just next door to the room. 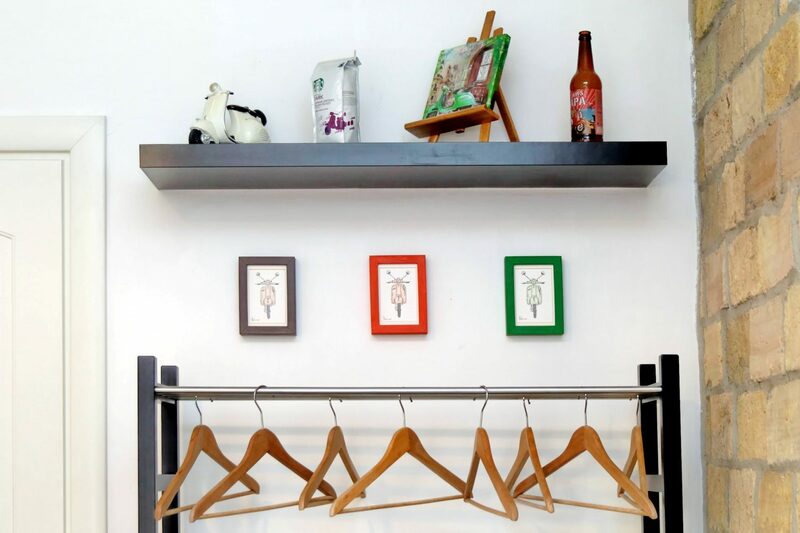 Elevator: Please note that mok’house Bed & Breakfast is at the 4th floor with no elevator, but the steps are short and we will be happy to help you with your luggage.